Nevada Gov. Jim Gibbons (R) last week signed into a law a bill designed to make it more difficult to home manufacture meth, even as meth lab busts in Nevada declined to near zero. In 2006, there were exactly three meth labs discovered in the state and none so far this year. The bill, AB 148, removes non-prescription cold and allergy medications containing pseudoephedrine, a meth precursor chemical, from convenience store shelves and requires that pharmacies put the products behind the counter. Customers who wish to purchase such items will have to produce identification and sign their names to a log, which law enforcement will be able to peruse in its hunt for the mysterious vanishing meth labs. Gov. Gibbons signing AB 148 -- at least he feels like he's doing something. "These measure will assist in our efforts to fight manufacture and use of this dangerous drug," said Nevada First Lady Dawn Gibbons in the governor's signing statement. "Far too often, we see small home labs that produce meth from basic cold medicines that you can buy over-the-counter. This legislation will allow consumers access to the medicines they need while at the same time preventing meth producers from obtaining excessive amounts for their home labs," she added, apparently oblivious to recent meth lab bust statistics. "This legislation tightens restrictions on the sale of over-the-counter products often used in the production of meth," said an equally oblivious Gov. Gibbons. "These safeguards will help to ensure that these products are used for their intended purposes." 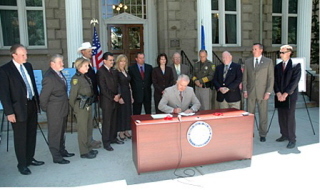 Despite mutual congratulations between the governor and the legislature, where the bill unanimously passed both houses, Nevada law enforcement officials acknowledged that the vast majority of meth now consumed in the state -- and the nation -- comes from Mexican "superlabs." Carson County Sheriff Kenny Furlong admitted as much when asked if that wasn't the case by the Nevada Appeal. "That's very, very true," he responded. "Legislation designed to make life harder on criminals who make methamphetamine is more symbolic than a practical tool for law enforcement," the Appeal noted. But, hey, at least it feels like we're doing something. Mexican Superlabs do not exist. This idea is just a cover for the methods used by the NIDA and DEA. The reason that the number of lab busts has gone down is very simple. Law enforcement is very quick to respond when good meth hits the streets. They hit the labs and lock the guys up. It's like wiping up ants. If you get enough of them the colony dries up. So where does the meth come from, you ask. The truth is that almost all of it is government issue. You do not have to look around for it or have to wait days for delivery. It all looks the same, tastes the same, and smells the same. There is a tiny radioactive gold foil in each bag. The same guy always has it. Its not very good, but good enough to remove most of the profit margin for clandestine producers. You also now know why clandestine labs stand out like a sore thumb. In California all the drug maker ex-cons are parolled to the Sacramento area and then set-up by making precursors available to them. Unfortuately for the authorities most of these guys are getting old and just do not have the drive they used to. Also many of them are dead or dying because of the poisons special added to the government issue sold to them. The street agents are kept in the dark and when they do realize the truth they are transfered to other policing agencies. Remember the mass defections from the leadership of the NIDA five years ago? Of course you do not remember. At the time you had your head stuck up your television like I did. If you are thinking about trying to make the good stuff yourself, forget it. The one-state-authorities and the DEA keep statistics on all possible precursors. You will be caught unless you go to a great deal of trouble to make all of your precursors from scratch. The key word here being all. For example suppose you go the toluene-oxime route. Sorry, but that bar of magnesium you got from the recreational vehicle center, just got you busted. Or for example suppose you did decarbox that single side-chain whatever to benzoic acid and are dreaming of nitropropene heaven. Sorry, that salt petre you got over the internet just got you popped. Oh don't get me wrong. You can do it, but it is hard for one person to get that motivated and more than one is also more than one mouth. If you are a white law enforcement officer I suggest that you ask you parents whether they were on drugs when you were conceived. Ask until you get the truth. The truth is, it is the drug users who produced most of the under-forty white folk you see around you. The heavy use of drugs began just after the introduction of birth control pills. Drug usage by young people is primarily, action taken based on a deep wisdom inside them which places reproduction above all the rules and stubbling blocks placed in their path to survival. Drugs and most particularily methamphetamine lead to disinhibition and in particular to sexual disinhibition. The removal of illicit drugs while allowing natural birth processes to be circumvented by "the pill" is an act of insanity. Our culture has been brought to it's knees. I am, in fact, proud of the fine job done by the NIDA and the DEA. I strongly disaggree with the decision to adulterate the medications for ADHD and Narcolepsy and the common cold but you would have done the same given the job with which they are charged. I pray that God help us all and saves up from our mistakes. However, the members of the medical community who, during the last quarter century have tore forty million infants from the wombs of the wives and daughters of the "greatest generation" will most surely burn in hell. The above comment is ridiculous. Nobody's tracking Mg or KNO3. There are no radioactive gold foils in the bags. wow that's the nuttiest post I've ever read. Makes the crap coming out of the mouths of the drug warriors sound sane.